Fall Law School Applicants – Now is the time to get organized and start preparing your applications for the fall. Here are three tasks for fall applicants to complete over the summer. First, request your letters of recommendation NOW. Who should you ask to submit a LOR on your behalf? Your letters should be written by professors or supervisors who are both in a position to evaluate your work and capable of expressing enthusiasm about your relevant talents and abilities. What is the best way to approach a possible letter writer? Make an appointment with your recommender to discuss your request. Explain your interest in law school and provide helpful information to assist the writer. This might include a copy of your transcript, a personal résumé that lists academic distinctions and accomplishments, and a copy of your personal statement or an explanation of why you want to attend law school. You may also wish to provide your grade point average and your LSAT score. If you are unsure as to what the writer needs, ask him or her. What do I do if I am graduating and planning to apply to law school in a year or two? Stay in touch with people whom you think would be able to submit a strong LOR on your behalf. Several of the law schools that require applicants to submit LORs prefer to have at least one of those letters come from faculty, even if you are not coming straight from undergrad to law school. How does the recommender submit the LOR? The process is handled through the applicant’s Credential Assembly Service (CAS) account which is set up via the Law School Admission Council (LSAC) website. Every law school applicant is required to apply to law school through their CAS account. Click on this link to learn more the LOR process. You can also check out our Compass page for a very helpful handout on this topic. Second, draft your personal statement. The personal statement is a 2- to 3-page essay that, when done well, introduces who you are and what unique qualities you bring to the institution while also highlighting your strengths and demonstrating strong writing skills. Check out Pre-Law Advising Service’s Personal Statement Do’s and Don’ts. Have someone else take a second look at your personal statement. Have someone else like a family member, professor, or friend review your personal statement or set up an appointment with one of the Pre-Law Advising Services advisors by calling the PLAS Office at 333-9669. Some law schools have a strict 1-page limit, while others are flexible. Check the requirements indicated on the application or the school’s website to determine the appropriate length. Consider the two Rs: recent and relevant. Ideally, each item on your résumé should be both, but at minimum each item should be recent or highly relevant. Ask us to review your résumé. The same process for personal statement reviews applies; please make an appointment by calling 217-333-9669 and email us your résumé 2 business days prior to the appointment. We’ll review it and be prepared to discuss it with you at the appointment time. Planning to apply to law school this fall? This summer is a great time to focus on crafting the perfect personal statement and resume, which are very important elements of the application process. This workshop will provide an overview of the personal statement and resume required for law school applications, plus it will cover: Brainstorming topics, how to begin, creating a timeline, how to make the resume and personal statement complement each other, and we will provide a four step plan to approach crafting these critical documents. Please register so that we can ensure enough seating and materials for everyone. Are you worried about writing an effective essay under time constraints? This workshop will focus on how to study for exams, plan your answers, start your essays effectively, and manage your time during exams. This workshop will be most useful for undergraduate students who are preparing for upcoming exams. If you have more questions about the writer’s workshop, visit their website. The Fulbright U.S. Student Program awards approximately 2,000 full scholarships annually to students for studies, research, or English teaching in any of 140 countries worldwide. The National and International Scholarships Program will provide a comprehensive overview of the grant and include advice from recent Illinois Fulbright recipients. There will be lots of time to get your questions answered and enjoy free pizza. The session is targeted to juniors, seniors, and graduate students who wish to explore Fulbright opportunities and ready materials for the Fulbright Priority Deadline of June 29, 2017 for grants beginning in fall 2018. Interested in pursuing a Fulbright Scholarship? If you are not currently on campus to take advantage of our Fulbright Information Session, join us remotely for this webinar! The same detailed overview will be provided for the Fulbright U.S. Student Program, including: eligibility, grant types, and application advice. There will also be plenty of time for questions and answers. Every year, Illinois students from multiple colleges receive Fulbright grants to serve as English Teaching Assistants (ETA) in many different countries. Join us for a workshop that looks in depth at some commonalities to putting together a winning ETA application to help you best portray the characteristics Fulbright is seeking. We also plan to have some recent Fulbright grantees on hand to share their application methods. Our goal is for you to leave the session with an outline and even a few sentences to start your statement of purpose essay for the Fulbright ETA application. You need not know your desired destination to benefit from this workshop. The session is targeted to undergraduates, recent alumni, and beginning graduate students interested in pursuing a Fulbright English Teaching Assistantship in 2018-19. Are you planning to apply for a Fulbright grant to research but don’t know where to start? Do you have a cool question you’d like to explore in a foreign country, but need the tools to design a viable research project? Join us for a crash course in research design and methods especially for Fulbright applicants! We will explain what a Fulbright selection committee will be looking for in your proposal, and then help you start laying the foundation of a solid research design. Topics will include: Tackling a literature review; posing a research question that you can answer with international fieldwork, lab work, or archival work; determining the appropriate data and methods for your research question; obtaining Institutional Review Board Approval. This workshop is intended to be a pressure-free, informal way to acquaint Fulbright applicants with the basics of formulating a strong research plan and laying it out clearly in a Fulbright Statement of Grant Purpose. One session is targeted to undergraduates and recent alumni, and the other for graduate students interested in pursuing research under a Fulbright grant in 2018-19. Resume, Cover Letter and LinkedIn Reviews — April 24, 2-4pm, Career Center Resources Center; April 24, 7-9pm, Undergrad Library, Consultation Corner. This workshop is offered on several other dates. Click here for more info. Starting a New Job: What to Expect the First Two Weeks — April 27, 5:30-6:30pm, The Career Center Interview Suite Suite 213. Click here for more info. Peace Corps Drop Ins — May 1, 2017, 11:30-1:30pm; The Career Center, Resource Center. Click here for more info. Please check out our recent blog post on scholarships. You can also go directly to our Compass page for a list of over 200 scholarships for undergrads and incoming law students! 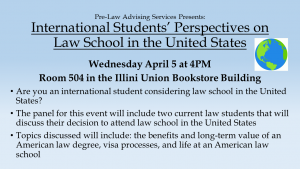 GREAT OPPORTUNITY FOR STUDENTS STAYING IN ILLINOIS FOR LAW SCHOOL! The Abraham Lincoln Marovitz Public Interest Law Scholarship is accepting applications until May 19. This scholarship awards $40,000 over 3 years to an incoming law student attending any Illinois law school who intends to pursue a career in public interest law. Click here for more details and to apply. Today’s guest blogger is Cary Shepherd, a graduate of the UIUC College of Liberal Arts and Sciences, where he studied History. Cary received a 171 on the LSAT, which is the 98th percentile (scores range from 120-180). After taking the LSAT, Cary became an LSAT tutor, working with students at UIUC and in Chicago. Cary is currently in his second year at the University of Chicago Law School. To read an extended version of this article, please visit the “LSAT Preparation” tab on the UIUC Prelaw Compass page. The Compass version contains important details about the preparation process, and links to LSAT studying materials. If you choose to attend law school, taking the LSAT will likely be one of the most important events of your career. Much like marriage, this pivotal event is not guaranteed to change your life for the better. Roughly 50% of marriages nationwide end in divorce; roughly 40% of law school graduates fail to find long-term jobs as attorneys. But there is good news. If being an attorney is the job for you, it is possible to improve drastically on the LSAT, and a great LSAT score will help to get you into a great school, maybe with a great scholarship! That said, doing well on the LSAT is no easy task. This article will provide you with the basic steps to success on the test. First things first – for the best results, you need to spend at least six months studying for this test. This next part is important: it is not possible to cram for the LSAT. Even if you study 40 hours a week, it takes time to absorb what you are learning. Success requires that you study for two hours per day, six days per week, for at least six months. I’ve tutored numerous law school candidates, and the ones who work hard generally improve an average of 1.5-2 points per month. Purchase and take an LSAT preptest that is no older than 2012. You need to do this at the earliest possible stage so you know your base-level performance. This will help you to focus your study efforts, and it will allow you to gauge how long it will take for you to reach your target score. It also allows you to better understand the advice given in your preparation guides. Purchase and carefully read a high-quality LSAT preparation book. Then reread it. Now again. If you purchase books divided into the three section types, start with the logical reasoning, then read the logic games, and finally the reading comprehension guide. You can read them all simultaneously, but if you start reading them one at a time, do it in that order. After you have been reading your study guides for about two weeks, it is time for you to start taking an LSAT preptest on a weekly basis. Carve out a time of the week that you always have free and take a four-section preptest. Make sure to use a digital proctor, a wooden pencil, an analog watch, and never give yourself extra time or extra breaks. When you finish the test, take a break and then correct your exam. Record your performance. Create a spreadsheet and input the date you took the preptest, the preptest number, your score, and how you performed on each section. This will allow you to track your progress and focus your efforts on the areas that need improvement. Once you have grasped the fundamentals of the sections types, you should start taking individual sections under real test conditions daily (i.e. take one 35-minute section each day). After you have taken your section, score it and correct the questions you answered incorrectly. Make sure you understand why you were mistaken on your incorrect answers, as if you fail to do this, you will fail to improve. Once you have reread your LSAT books ad nauseam, you can put them on your shelf for a while. Use this extra time to increase your preptest schedule to twice a week, and spend more time taking individual 35-minute sections. The key to this phase is correcting both your answers as well as your habits. For example, if you find yourself becoming unfocused, note this, and labor to resolve that issue. If your records indicate you are regularly missing “parallel reasoning” questions, reread the chapter on these, and check out what other reputable LSAT guides say on the topic. A lack of obvious improvement can be demoralizing. Mental health aside, this will make it hard to keep studying for dozens of hours every month if you haven’t seen your score increase in weeks. But if you are studying intently – even if your score doesn’t show it today – you will improve eventually. I’ve gone as long as six weeks without seeing any improvements. When I finally did make that next breakthrough though, it was well worth it and the results were apparent. Good luck, and try to enjoy yourself! Please note that there is more than one way to prepare for this test. I’ve had considerable personal success using this approach, and many of my tutoring students have benefited from these practices as well. Additionally, these points only scratch the surface of the best preparation methods. Many students benefit from additional practices ranging from meditation to reading National Geographic. If you have any questions, or if you are interested in tutoring services, please feel free to email me at lsat.shepherd@gmail.com. I offer a free introductory tutoring session, and I am always happy to hear from UIUC students. 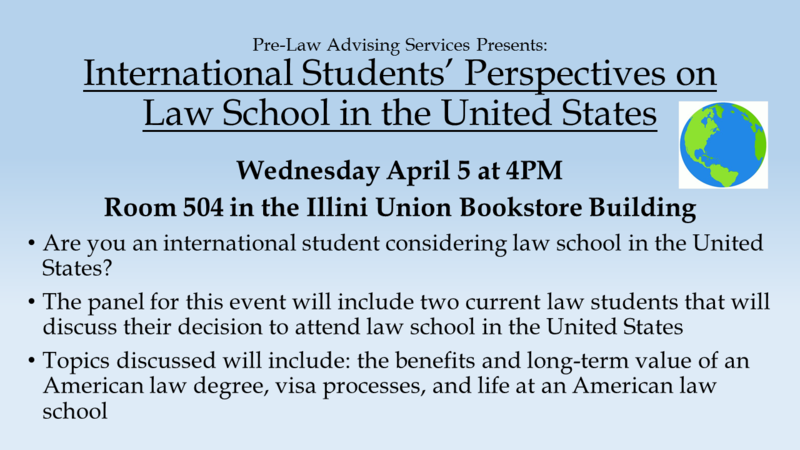 This workshop is designed for students who plan to apply to law school this fall. We will provide an overview of the application process, including: Understanding the Credential Assembly Service, getting recommendations, creating an application strategy, researching law schools, budgeting for the application process, suggested resources to use, LSAT considerations, and more. Time for Q&A will be available. This workshop does not cover writing the personal statement, which is covered in the separate workshop on Perfecting the Personal Statement and Resume for Law School. The Family Resiliency Center is currently accepting applications for the HDFS 494: STRONG Kids undergraduate research course. The STRONG Kids Research Program provides a unique, team-based, hands-on research experience working with over 450 families with children aged 3 months-4 years. Applications are due THIS FRIDAY, April 21st! Applications will be reviewed and interviews conducted the last week of April. The link to the application is below. The purpose of these two-semester year-long supervised research course is to provide students with a first-hand experience working as part of a research team as well as to help them develop a working knowledge of the theory and applications of transdisciplinary approaches to obesity research. Additional information about this course, as well the application can be found on our website at: http://familyresiliency.illinois.edu/education/undergraduate-students. The two main sections of a Fulbright application consist of 1) an essay describing your Fulbright project and how you will spend your year—Statement of Grant Purpose, and 2) an essay describing why you should be the one to do this project—Personal Statement. We will dissect the key components Fulbright reviewers are seeking to glean from the personal statement, review and discuss past winning Fulbright personal statements, and assist you in beginning to sketch and portray your own story. You need not know your desired destination or specific Fulbright project to benefit from this workshop. The session is targeted to juniors, seniors, and beginning graduate students who wish to apply for any type of Fulbright grant and ready materials for the Fulbright Priority Deadline of June 29, 2017 for grants beginning in fall 2018. Resume, Cover Letter and LinkedIn Reviews — April 17, 2-4pm, Career Center Resources Center; April 17,7-9pm, Undergrad Library, Consultation Corner. This workshop is offered on several other dates. Click here for more info. Please check out last Wednesday’s blog post on scholarships. You can also go directly to our Compass page for a list of over 200 scholarships for undergrads and incoming law students! Scholarships, scholarships! Over 200 scholarships for undergrads and incoming law students! Whether you’re heading off to law school this fall or staying here to continue your pre-law education, you’ll want to see this: Scholarships! Could you use an additional $500, $1000, or even $40,000 towards your undergrad or legal education? Then take a look at this resource. We have compiled over 225 scholarships available for BOTH incoming law students and pre-law undergraduates. Below are some examples. Head over to our Compass page to find the full listings–but hurry, because some have upcoming deadlines! The full spreadsheet with 200+ scholarships is the very first item posted on our Compass page. The American Injury Attorney Group is sponsoring a $1250 scholarship for an undergrad or law student who submits a 500+ word essay on creative marketing strategies for personal injury lawyers. Deadline: April 30. The Baumgartner Law Firm Law Student Scholarship awards $3,000 to an incoming or continuing law student based on need and commitment to helping others. Due August 31. Burke & Eisner offers two scholarships: One for single mothers who are pursuing undergraduate or graduate education, and a second scholarship for law students. Due July 30. Coil Law, LLC offers a $500 scholarship for undergrads with a 3.0 GPA who plan to go on to law school. Applications due May 31. Head over to our Compass page to explore over 200 more scholarship opportunities! Are you headed to law school this fall? 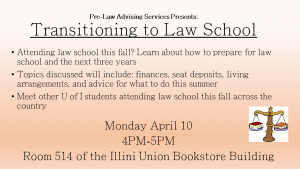 Join us for Transitioning to Law School TODAY at 4:00 in 514 Illini Union Bookstore Building to learn what you need to know before heading off to law school! From finding living arrangements to what to buy/get or get rid of, hear from current law students what they wish they’d known before starting law school! 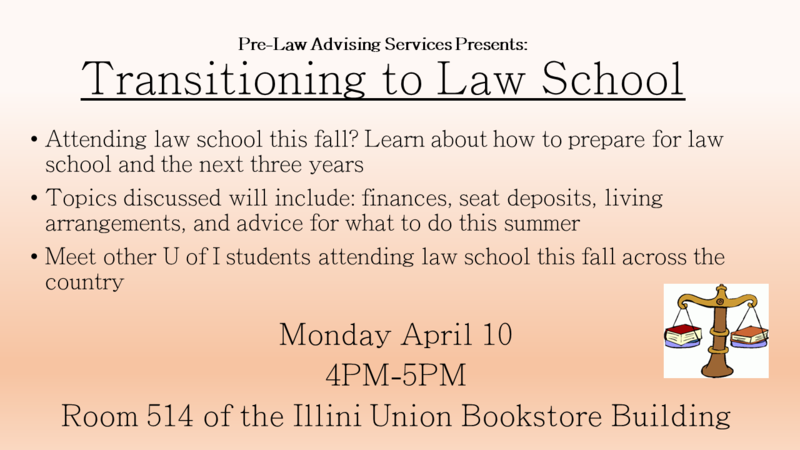 Applying to Law School: A Workshop for Fall Applicants–Monday, April 17, 4:00 in 514 Illini Union Bookstore Building. This workshop is a great starting point if you are planning on applying this fall. We will provide an overview of the application process, including: Understanding the Credential Assembly Service, getting recommendations, creating an application strategy, researching law schools, budgeting for the application process, suggested resources to use, LSAT considerations, and more. Time for Q&A will be available. This workshop does not cover writing the personal statement, which is covered in the separate workshop on Perfecting the Personal Statement and Resume for Law School. Perfecting the Personal Statement & Resume for Law School: A Workshop for Fall Applicants–Tuesday, April 25, 4:00 in 514 Illini Union Bookstore Building. This summer is a great time to focus on crafting the perfect personal statement and resume, which are very important elements of the application process. This workshop will provide an overview of the personal statement and resume required for law school applications, plus it will cover: Brainstorming topics, how to begin, creating a timeline, how to make the resume and personal statement complement each other, and we will provide a four step plan to approach crafting these critical documents. Click here to register so that we can ensure enough seating and materials for everyone. The Career Center is hosting a Summer Break Job Shadow Program for a one-day job shadow opportunity. Visit their program handbook here for more information–applications to participate will be accepted April 17-21. Hire Big 10 Plus Virtual Career Fair–April 12, 9-6 pm. Click here for more information. The decision to take a gap year is a personal one and the choice is up to you. There are many factors to consider when you are thinking about taking a gap year versus going straight through to law school. Here are some questions and answers commonly associated with taking a gap year. First, what is a gap year? – to determine whether law school is the correct choice. Second, if you decide to take a gap year, where should you work? Third, if you decide to take a gap year, what should you do before your graduate? – Find a professor that you are willing to keep in contact with for a letter of recommendation. Ideally, you want to have a recent letter, so keeping in contact with a professor during your time off is the best choice. When asking your professor for a letter of recommendation – provide information about how you did in their class, work from that class you completed, and give the recommender enough time to write a letter. – Try to take the LSAT! It is much easier to take the LSAT while you are in school than when you are working. Your LSAT score is good for 5 years. – Set up a CAS (Credential Assembly Service) account and make sure to submit your official transcripts from the University and have them on file with the LSAC. – Start networking early! Don’t be afraid to reach out to lawyers/others in the legal sector early on, even as an undergrad. A diverse and broad network will help you later on in your legal career and can provide for opportunities for mentorship. Fourth, what skills should you focus on during your time off that will be helpful in law school? Also, keep in contact with Pre-Law Advising Services. We happy to make appointments with alumni as well as current students. Call 217-333-9669 to schedule an appointment with us.